JayWalk - All Your Xmms Are Belong To Me: I Love Waffles! First stop was Houston, Texas and I checked in the Wingate Inn. Crappy hotel but certainly much better than the Days Inn in Tupelo where you get bugs showing up in the sink, better a beetle or a black silverfish. Every time coming back to that hotel is a surprise. It's always a wonder what the "Catch Of The Day" was whenever I step back into the hotel at the end of the day. Anyway, back to Wingate, I saw this fabulous contraption when I went down for breakfast. 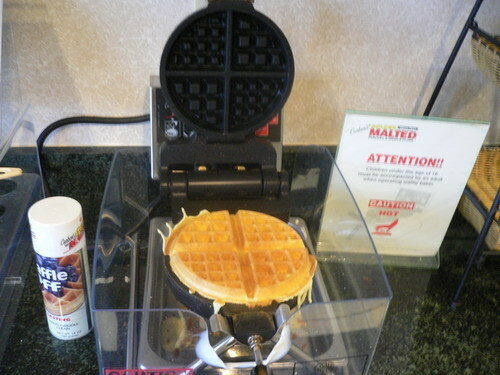 It is a self-service kind of arrangement before I spotted this waffle maker. The batter mix is all prepared and in cups. All I have to do is take the cup, pour the mix into the waffle iron, close it, turn it over to start the 2-minute timer. Mmmmm... yummy.. haiz, must go pay Prima Deli 70cents for this liao..
Prima Deli's waffles not hard enough.. i like those from A&W with ice-cream and syrup.. but is no longer around..
Chocolate & Gary: Yah, I remember A&W Waffles with ice-cream. Don't forget the Root Beer Float too! Yum! wow, your Waffles, so well done! sunflower: The waffle iron was pretty no-brainer. Just take the cup of the waffle mix and just pour it in. That's it. ha, your reply make my question sound toopid _""
Anna: It tastes pretty good too. Too bad no ice-cream but mai hiam buay pai lah!